Beautifully engraved SPECIMEN certificate from the Goldblatt Bros., Inc. This historic document was printed by the Security Banknote Company and has an ornate border around it. 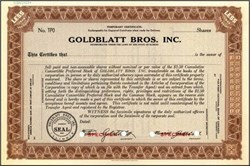 The certificate has the printed signature of Maurice and Nathan Goldblatt as officers of the company. One of the nation's oldest large neighborhood department stores, this is the first in a regional chain of more than three dozen stores founded by brothers Maurice and Nathan Goldblatt. The company's "value-oriented services" and innovations helped revolutionize American retailing.